Why are time series so interesting ? A time series can tell us about how a particular parameter (green cover, water area, etc.) varies with time. The idea is that if we can understand the processes that cause the changes, we may be able to model and predict future changes. 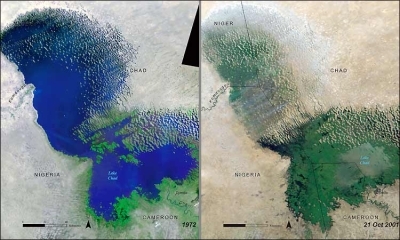 Lake Chad in Africa in 1972 and then later in October 2001. Source: UNEP/GRID-Sioux Falls.